Fine quality tea from high elevation gardens, gently processed to bring out the tea’s smooth, robust flavor. 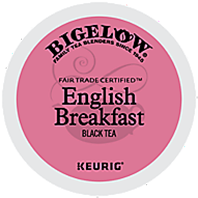 Enjoy this robust English Breakfast blend of fine teas, and start your day in true British fashion with this Bigelow K-Cup tea pack. Brew Bigelow® K-Cup Packs in your Keurig brewer and enjoy the Café experience at home or work. Air-tight, single serve K-Cups lock in freshness and deliver the rich, full flavor of Bigelow teas you know and love!